Group members are requested to help the management in keeping the dormitory and rooms clean after use, and to maintain cleannines in the bathrooms. 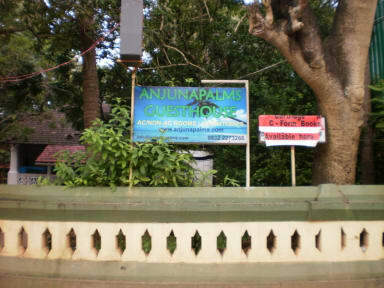 We are a family run Guesthouse providing a reasonable and memorable stay to our tourists and other guests.Ten minutes away from Anjuna Beach in a typical Goan village atmosphere, our house is a homely, family-run affair. We are only 10 minutes walking distance to the popular Anjuna beach and about 20 minutes walk to the Wednesday Fleamarket. We provide all basic guesthouse amenities and laundry service and hot/cold shower 24 hours. Also for your comfort we have restaurant and food is available at any time. Bikes can be hired from our contacts to make your discovery of Anjuna a bit more comfortable and there is always a doctor on call in case of emergency!, Internet access at rupees 30.00 per hour on hostel computer, wifi at rupees 75 / per day to all dormitory beds booking, all other room types WiFi is free during the stay with us, Our deluxe private ensuite room has air conditioning with remote control, cable T.V and wired internet connection . Great place for budget travelers, backpackers and the like. The staff were great and the owner let me stay longer into my last day when I was sick, they're good people. The rooms are open to the elements and the bathroom could use daily work. Great location amongst the action in anjuna. Good value for money compared to a lot of other hostels. Basic rooms and bathroom. No common area or atmosphere but nice courtyard garden. Conveniently located next door to the supermarket. Everything was quite ok, I just missed water twice in the morning. Good location & owner is cooperative. The room we booked was supposedly to have a double bed and its own washing facilities but instead we were left with two what can only be described as half beds as they were so small with a matress that was made of stone, our own washing facilities were the shared bathroom which was beyond unclean and was not wortg washing in. All in all very average good for a cheap place to stay but not good if you want to actually sleep the night and clean yourself in the morning. On arrival the staff didn't know about our booking. After showing our confirmation details we were kept waiting 20mins before they agreed we had a reservation. They said it was lucky they still had a room available! The room was not that clean, hard bed, no net and thousands of mosquito's. On checking out the guy insisted the deposit was a booking fee and charged us the full amount including the deposit. We have Never seen so many mosquito's in a room, the guy was less than helpful. They didn't even accepted my booking. They said we have stopped accepting bookings from Hostelworld. It was just a loss of money. How I will get back that money which I already paid on website.